Today I commence the serialization of some aspects of my work on the music of African-American composer Ulysses Kay, which I have engage since 1995. In this post I present a brief biographical overview of Kay as a composer. 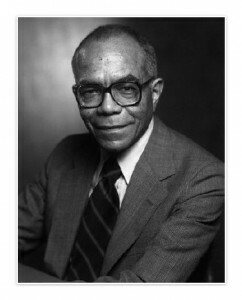 The passing of African-American composer, teacher, and scholar Ulysses Kay, on May 20th 1995, marked the end of an illustrious career. Born on January 7th 1917, his musical education commenced at the tender age of six, when he began the study of the piano. Study of the violin was added in the ensuing years and he began to play the saxophone at age fourteen. It was around that tine that the young Kay became involved in a neighborhood combo and his interest in composition and orchestration was kindled. In 1934 Kay entered the University of Arizona as a liberal arts major. He soon chose music as his major and graduated with his Bachelor of Music degree in 1938. He then pursued a Master’s degree in composition at the Eastman School of Music. Scholarship grants allowed him to study with the renowned German composer, Paul Hindemith, first at the Berkshire Music Center and then at Yale University. Kay enlisted in the United State Navy in 1942 and played saxophone, flute, and piccolo in the Navy Band. He also played the piano in a dance orchestra. This period of military service (1942-46) proved to be extremely fruitful for Kay as a composer. Some of his compositions written during this period include: Flute Quintet (1943), Of New Horizons (1944), and Suite for Orchestra (1945), which received the B.M.I Orchestral award in 1947. After the war, Kay studied at Columbia University on an Alice M. Ditson Fellowship. He was the recipient of numerous other fellowships: a Fulbright Scholarship, two Prix de Rome (scholarship awarded for study at the American Academy in Rome), a Julius Rosenwald fellowship, and grants from the National Institute of Arts and Letters. These allowed Kay to travel and study in Europe. During this period ne produced his Piano Quintet (1949), String Quartet No. 1 (1949), Brass Quintet (1950), Fugitive Songs (1950), and a film score: The Lion, The Griffin and the Kangaroo (1951), for a documentary filmed in Italy. After returning from Europe, Kay became music consultant for Broadcast Music. He has been honored with prizes from the American Broadcasting Company and the New Jersey Council of the Arts. He has received commissions from symphony orchestras and universities, and has been the recipient of honorary degrees from Lincoln College (1963), Bucknell University (1966), the University of Arizona (1969), and Illinois Weslyan University (1969). In 1968, Kay was appointed Professor of Music at Lehman College, City University of New York, and became Distinguish Professor of Music at the university in 1972. Kay’s offering to the twentieth century’s pool of music has been plentiful. As Hobson and Richardson point out, Kay produced mote that 135 compositions representing a tremendous outpouring of diverse forms . His works include five operas, over twenty large orchestral pieces, fifteen chamber pieces, a ballet score, and numerous other compositions for voice, solo instruments, film, and television. Throughout his career, which spanned five decades, Kay’s music has received tremendous acclaim. Performances of his compositions have been reviewed in many literary publications, including the New York Times and the American Composers Bulletin. In fact, following his death, obituaries appeared in major print media such as: New York Times, Los Angeles Times, Washington Post, Boston Globe, and Amsterdam News. These obituaries all testify to the high regard with which Kay’s work had been held, and point to his significance as a twentieth-century composer. Kay’s music has also been the subject of scholarly study. His choral works received the scholarly attention of Donald Armstrong, who in 1968 critiqued Kay’s compositions for women choruses, together with the works of other contemporary composers such as Elliot Carter, William Schumann, and Virgil Thomson . And in 1972, Richard Hadley presented an analysis of Kay’s published choral music . In his article Kay’s Fantasy Variations, Lucius Wyatt writes that the composer’s ingenious handling of the resources of the orchestra and his skillful organization of the harmonic, formal, rhythmic, and textural details, show Kay’s appreciation and understanding of the past, although he employs compositional techniques of the twentieth century . L. M. Hayes recognizes three stages in the development of Kay’s musical style. He points out that in the 1940s Kay produced music that contains a strong harmonic base with mild dissonances. In the 1950s his work becomes more contrapuntal, harmonies are more dissonant but tonality remains secure, although clouded by more active chromaticism. At the beginning of the 1960s, according to Hayes, Kay’s musical style crystallizes into a music that is articulate, expressive, moderately dissonant, lyrical, and predominantly contrapuntal . Hayes goes on the note that Kay’s musical style has been termed neoclassical on occasion, and neo-chromatic at other times. He attributes this inability to firmly categorize Kay’s style to the fact that the composer successfully assimilated the styles and forms of past eras. Hayes concludes that the most accurate classification of Kay’s musical style should be that of eclectic modernist, since his music has a personality of conservative yet modern . See Hobson, Constance Tibbs, and Deborra A. Richardson. Ulysses Kay: A Bio-bibliography, Greenwood Press, Westport, CT, 1994, 3. Donald J. Armstrong. A Study of Some Important 20th Century Secular compositions for Women Choruses, with a Preliminary Discussion of Secular Choral Music from a Historical and Philosophical Viewpoint, D. M. A. dissertation, University of Texas at Austin, 1968. Richard Hadley. The Published Choral Music of Ulysses Kay, Ph. D. dissertation, University of Iowa, 1972. See Wyatt, Lucius. “Ulysses Kay’s Fantasy Variations: An Analysis”. Black Perspective in Music 1 (1977): 75. See Hayes, Laurence M. The Music of Ulysses Kay, 1939-63, Ph.D. dissertation, University of Wisconsin, 1971, 332-334.